Can Retail Model Marketplaces Challenge TAMPs for Assets? This article is the second in our series on the tools and technologies that help connect asset managers to their distribution networks. Whether they are called hubs, exchanges or marketplaces they have a wide variety of functionality and business models and they all share one key feature; ability to transmit managers’ investment models to sponsor firms and advisors. We previously wrote about institutional model hubs (See 7 Model Hubs Battle for SMA Managers & Sponsors), which are B2B products that connect sponsor firms and asset managers. They are designed to be more like packet switching routers that move investment models from managers into the vendor platform to be distributed. Advisors never interact with these tools since their firms have operational staff that handle these tasks. Retail Model Exchanges are designed with advisors as the primary users. These exchanges are designed for advisors to be able to browse and select from a smorgasbord of managers, ETF’s and fund providers and build their own investment models. My good friend and industry guru, Michael Kitces, wrote an excellent piece on the emergence of model marketplaces. I would recommend reading his article for a brief history of turnkey asset management platforms (TAMPs) and an explanation for how these marketplaces are unbundling what had been traditional TAMP services. Model marketplaces are a major shift in the landscape of investment management. It allows financial advisors access to a broad range of third-party-created investment models while retaining control over implementing trades. At the same time, marketplaces offer asset managers a new for distribution channel for their products that are quickly becoming commoditized. With this development, model marketplaces are being introduced with an astonishing speed. Just during this year, Riskalyze, Orion and TD Ameritrade have launched or announced their offerings. With so many firms jumping into the fray, what is the current state of model marketplace solutions? Three of these are from custodians (Folio Institutional, TD Ameritrade, TCA) and three are from technology companies (Orion, Riskalyze, HedgeCoVest). This is a good opportunity to compare and contrast how the different firms structured their offerings. The partner store offers models from ten third-party providers, including AlphaDroid, Cambria, CLS Investments, LikeFolio, SEI, Morningstar Managed Portfolios, Blackrock and First Trust. The core offering is similar to the manager network offered by full service TAMPs such as Envestnet or FolioDynamix, albeit on a much smaller scale. In addition to the third-party models, the Partner Store inventory includes 21 pre-constructed “Risk Number” models that are available at no charge for up to $10 million of AUM. 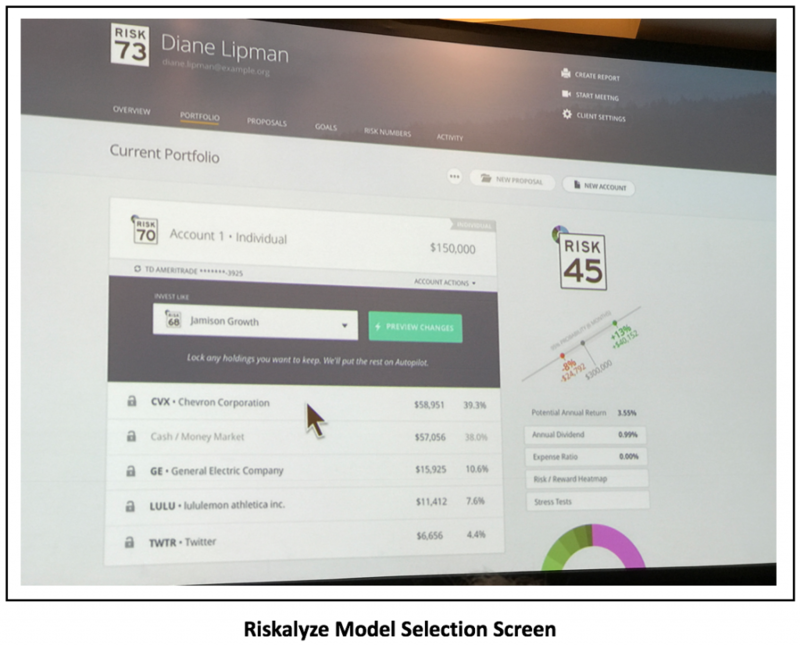 In the initial test drive, we liked the workflow that Riskalyze created for manipulating their models. Advisors can review and edit external manager models, which by itself is a table stakes function now. 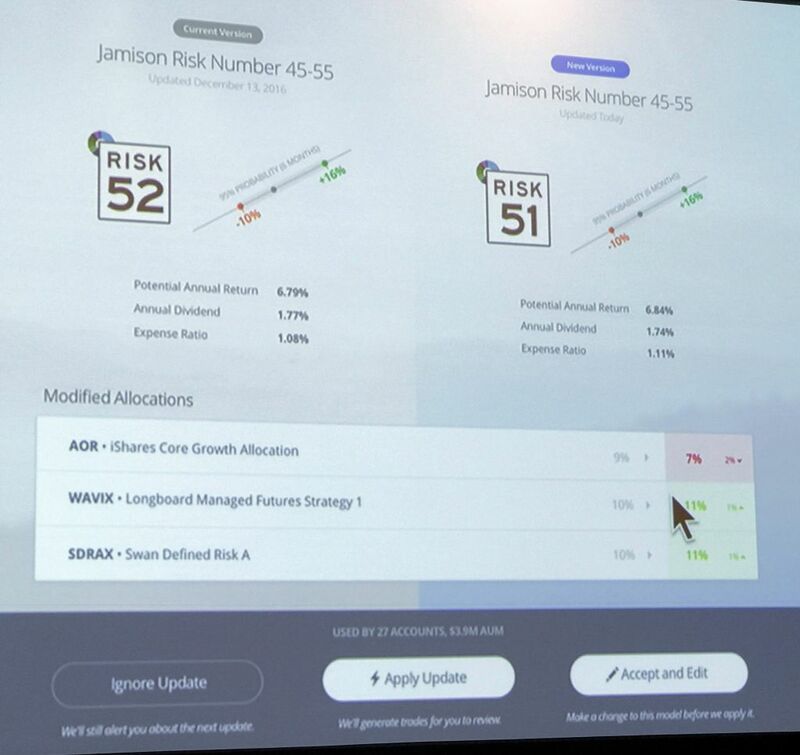 What is unique is that Riskalyze displays the before and after model changes side by side for the advisor to review and approve. 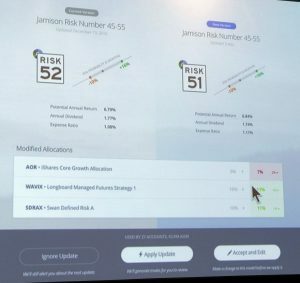 The system will also highlight any changes in the risk profile (via their risk number), allowing advisors to accept model changes, continue to edit or abandon the updates altogether. We wish the platform offered deeper tax management functionality. After model changes are reviewed, the advisor does get a preview of the trade including estimated trading costs and capital gains. It would be great of the advisor could get a warning about capital gains before he or she is about to execute the trade! The pricing for the AutoPilot Partner Store begins at 15 bps and goes down to 10 bps for advisors with a $5 million AUM commitment. The overall costs for an advisor using Riskalyze AutoPilot, Pro-Premier and proprietary models will start at 25 bps, plus the monthly per-advisor fee for the underlying risk profiling solution. The AutoPilot Partner Store is part of Riskalyze’s move into the crowded TAMP space and was probably the primary driver of last October’s $20 million equity investment from FTV Capital. They seem to have flooded the market with their risk profiling software, so expanding into vertical markets makes sense. Plus, selling models generates asset-based revenue versus per seat licensing for software. It is more lucrative since revenue automatically increases as your clients’ assets grow. Riskalyze still has a ways to before advisors trust them to outsource their investment management. Considering their past success, odds are that they will be successful. This peer-to-peer option is a differentiator. No other exchange offers the ability for advisors to share their own models with other advisors. The Communities model marketplace is a part of the newly unveiled Eclipse platform. Our first impression of Eclipse is a fresh clean look, combined with long-awaited asset location functionality and ability to automated tax loss harvesting. Consistent with Orion’s user experience, the new generation platform is a series of interconnected dashboards. Each view provides access to actionable items as well as opportunities to drill down into detail. Compared to its competitors, Eclipse is unique in how it approaches model building. The goal of the developers was to “have fun with how users can construct models,” and the result is unlike anything else we have seen. Advisors can build models in an environment that is highly interactive and visual. They can drag and drop “containers of securities”, combine and change underlying sub-models and asset classes. Tolerance bands and drift preferences can be customized at the sub-model level. This is an innovative virtual playground that provides advisors with a visual hierarchy and structure of their models. For new users, the underlying setup is straight-forward. Most advisors use the same set of 10-12 underlying “core” category models that are combined and blended to suit the needs of their clients. Once those sub-models (like “equity” or “large cap”) have been created, they can be used as building blocks (think a grown-up version of Legos). There is no limit on the number of model levels (models of models), although Orion reports no current use cases past four levels. Setup time varied by firm and how many modeling exception it has. A firm with simple needs and few modeling exceptions could be up and running in as little as a couple of days. Complicated clients could take up to a month. 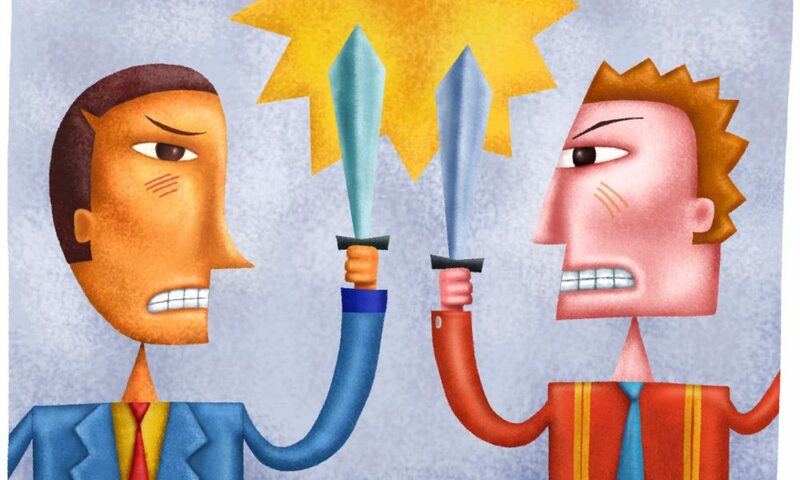 Most clients fall somewhere in between. The launch of Communities will take place in two steps, according to Randy Lambert, Orion’s President. The first is signing on third party model providers and the second will be giving Orion advisors tools to share their own models. Lambert could not disclose model provider names but mentioned that 5-6 “household names” will be offering their SMA’s on the platform. Advisors will be able to create their own websites within Communities to house their models, marketing materials and past performance data. So far, advisors have been receptive. Orion leadership expects there will be a few dozen advisor strategies available at the time of the full launch. As more firms join Communities, we will be able to see the full scope and impact of the peer-to-peer model sharing. The current vision is that interested advisors will be able to review model performance and buy models from other advisors – all the while retaining control and discretion over exclusions, rebalancing parameters and trading. This functionality is similar to the Folio Institutional Model Manager Exchange that also allows advisors to license their strategies to other advisors. 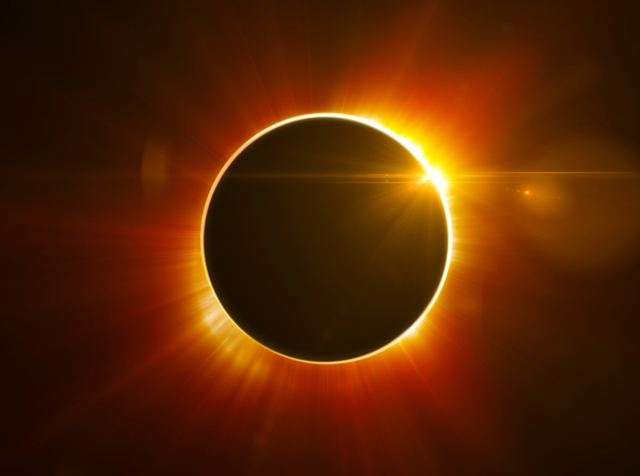 The cost of the Eclipse platform is 15% on top of the per-account charge of the underlying Orion solution, but the vendor is not marking up the models or requiring back-end revenue sharing fees from the providers. As Lambert put it, Orion’s goal is to enhance the offering to the advisor universe while holding true to their philosophy of remaining agnostic. The tagline for this offering invites advisors to “Be your own model manager”. Advisors can build their own models, license models from third-party asset managers or take advantage of 160 “ready to go” models that can be tweaked to suit the individual needs of their clients. Folio Institutional is one of the “boutique” RIA custodians that target smaller advisory firms and solo practices with very low or no minimums combined with technology and personalized customer service. They are a subsidiary of FOLIOfn Investments, Inc., a self-clearing broker-dealer that started in 1999. Folio’s Model Manager Exchange (MMX) can be broken down into three sub-offerings. First, advisors can build their own models from scratch using equities, mutual funds, EFTs and ETMFs as components. Second, advisors can license models from third-party asset managers (or even offer their own models on the exchange as a tool to earn additional revenue). Finally, there is a library of Ready-To-Go Folios ™ that is available as a basis for model and portfolio building at no additional charge. MMX is a nice addition to the Folio trading and rebalancing platform, which was originally built as a robo-advisor called Advisor Connection. It has since gone through a number of iterations and is now used by a number of turnkey asset management platforms (TAMPs), smaller banks and credit unions. Only 15% of Folio’s business is retail, according to the firm’s president, Greg Vigrass. The other 85% is spread across RIA’s, broker-dealers, insurance companies, TAMP’s, banks, and credit unions. An interesting aspect of Folio’s MMX is its use of fractional shares, which means that models can be applied to accounts of any size. This contrasts with the SMArtX approach of basing the account minimum on the lowest account value that it would take to replicate the strategy in whole shares. Folio recently added 31 Morningstar® Managed Portfolios ETF and mutual fund models to MMX including asset allocations for both tax-sensitive and tax-deferred accounts. Model-building capability is robust, with an option to focus on specific sectors, investing styles or geographic regions. Multiple-level models of models are supported as well. The platform includes analytics that allow advisors to measure their models against benchmarks and other industry statistics. Advisors who wish to tap into additional research and model-building expertise can connect with Folio Research, an affiliate firm (presumable for a fee, although we could not locate details on the firm’s website). Folio has quietly built out an impressive suite of advisor-focus products as well as an open architecture back-end technology platform that is full-accessible via APIs. Some recent high profile client wins include developing a digital advice channel for the US Navy’s Federal Credit Union and acting as the broker-dealer and providing technology for Sally Krawcheck’s ElleVest robo-advisor. MMX currently has the widest offering of managers of all the retail marketplaces. TD Ameritrade pre-announced the iRebal Model Marketplace in early 2017 at its National LINC conference at part of the new VEO One ecosystem. The Model Marketplace launch is scheduled for the fourth quarter. The iRebal Model Market Center is being described as a “supermarket for model portfolios”. Advisors will be able to pick models from product manufacturers and third-party asset managers. The Model Market Center will be available to firms that custody with TD Ameritrade, as well as others who use iRebal as their rebalancing engine. When it comes to model providers, the word is that there will be at least 5 “product manufacturers” who will supply strategies for Phase I of the launch. These models will be available to advisor users at no charge and will most likely only include EFTs and mutual funds. In the second phase of the roll-out, the marketplace will add models by third-party investment managers. No word yet on the pricing for those, or on which investment managers will be represented. Based on our early look behind the curtain, advisors will be able to search and filter strategies to locate best-fit options for their clients. They will have an opportunity to review marketing materials, presumably in a document vault of some sort. No indication yet on whether third party research will be available. Other vendors have shared with us that many advisors are too cost-sensitive and do not place a premium on third party research. Once advisors subscribe to a model, it will be pulled into the core iRebal engine. Advisors will be able to customize the model and combine them together to create UMAs and creating rules for different tax segments. Any model changes made by managers will be available to the advisors immediately. This sounds similar to the SMArtX real-time offering, although the devil is in the detail. We would have to see the final product before rendering an opinion. Advisors will retain discretion over accepting these proposed changes, consistent with the core value proposition of a Model Marketplace: to give advisors tools for managing portfolios and step back when it comes to execution. SMArtX is a model marketplace that is currently available exclusively to Advent clients. It offers deep integration with Black Diamond. We loved SMArtX’s intuitive workflow, real-time performance, trading capabilities that minimize dispersion and its exceptionally deep due diligence. The marketplace currently has 180 models with plans to add more over the next three months. The TAMP market has attracted over $300 billion in assets with innovative products and the latest technology to improve advisor efficiency. Most traditional TAMPs design their platforms to be outsourcing solutions where they handle all investment decisions and trading. All the model marketplaces covered here are trying to disintermediate the traditional TAMPs by offering models directly to advisors. But none provide SMA strategies or the sophisticated filtering tools necessary to comb through the myriad of options so advisors can build appropriate portfolios for different clients. SMArtX (which stands for Separately Managed Accounts Real-Time Exchange) was designed specifically to deliver SMA strategies to advisors with powerful analytical tools for research and portfolio construction. This sets them apart from the other marketplaces and also targets a different advisor demographic that focuses more on SMAs and UMA’s than other accounts. We enjoyed the user experience that SMArtX has developed. Its advisor dashboard is exception-based and intuitive. The ability to search and filter across hundreds of manager strategies is excellent. Each strategy has an overview page with details about the manager and their methodology. The overview page also has real-time pricing and intra-day performance, which I have never seen on any platform before. While I do not expect an advisor to select one manager over another based on today’s price of their strategy, it is a cool feature and highlights the platform’s real-time pricing capabilities. SMArtX currently has over 180 models from 100 managers with plans to add 100 more models over the next three months. That includes money manager strategies that are not available on competing marketplaces as well as custom index products with minimums as low as $5,000. Some of the products developed by SMArtX, like their S&P 500 custom index, are free to advisors. “Our advisors are looking for a scalable platform with access to best-in-breed investment managers and cutting edge solutions,” shared Evan Rapoport, CEO of SMArtX. The system offers extensive filters that include regions, account compatibility, asset class, sector focus, model types, model strategies and more. In-depth statistics are provided such as Sharpe Ratio, Sortino Ratio, R Squared, Top Short and Long Holdings to help advisors select the right strategy. Models can be edited and saved as drafts, so that advisors have the tools to test-drive ideas and dynamically tailor marketplace strategies to the needs of their clients. Another unique feature of SMArtX is the depth of due diligence that goes into selecting the managers for the marketplace. In order to qualify to offer strategies on the platform, managers must have zero infractions on their records. They must also submit to extensive background checks covering their criminal, credit and regulatory history. Furthermore, managers must present a three-year performance history and undergo a strategy audit. In other words, SMArtX does not simply rely on publicly available data (which is often not audited) but does their own audit for an additional layer of assurance. The extra time and effort that goes into the SMArtX due diligence serves as natural limit on the number of managers that would qualify to be in the marketplace. This means they will never has as many managers as Envestnet, for SMArtX leadership, the additional assurance is worth it. While the platform does not offer any third party research, they do provide advisors the tools to generate “fact sheets” that rely on audited data. Asset managers can upload marketing materials and even webinar recordings into the platform’s vault to address frequently asked questions and offer additional insights into their models. This empowers advisors to do their own homework. Their Portfolio Builder is well-designed and easy to use. It dynamically updates key statistics such as standard deviation and estimated performance as strategies are added and removed to help the advisor tweak the portfolio. When it comes to the platform’s reach, we must note that SMArtX is only available to Advent clients and primarily targeted at firms using Black Diamond. SMArtX can be thought of as both a model marketplace and also a wealth management platform. It can handle not only model management, research, and portfolio construction, but account opening, trading, rebalancing and even performance. This puts SMArtX in the same category as Orion Eclipse, although their rebalancing and trading functionality is nowhere near as comprehensive as Orion’s. Unfortunately, there is no single sign on functionality for Black Diamond/SMArtX users right now, it is on the product’s roadmap. The developers are getting requests for integration with Advizr and eMoney, so more APIs could be coming in the future. SMArtX charges 5-15 bps as a platform fee that also includes the Black Diamond subscription fees. The cost of models varies by manager (and some models, like the S&P 500 index model, are offered at no additional charge). Trust Company of America Money Manager X-Change (TCA MMX) has a unique characteristic among the marketplaces in that it has been in existence for over ten years, while the others are relatively recent releases. TCA revamped the UI and functionality and relaunched MMX last year. Longevity is not the only positive feature of MMX. It supports both professional manager products and peer-to-peer advisor models as well. The advisor models have become so popular that the assets in them are already over $1 billion, according to CEO Joshua Pace. TCA, headquartered in Centennial, CO, has seen their assets increase 38% since 2014 and currently stand at around $16.5 billion, Pace reported. 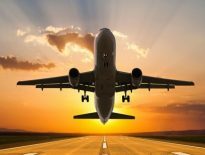 A significant percentage of assets are concentrated at some of their largest clients, which include Scottsdale, Ariz.-based United Planners Financial Services and Glastonbury, Conn.-based Symmetry Partners LLC. MMX has basic search functionality with the ability to filter by manager name, investment vehicle, average trade frequency, fee and minimums. Unfortunately, there are no options to filter by MPT statistics or performance history, but you can see individual model performance when drilling down into the search results. Pace explained that there are actually two separate model exchanges; one called MMX, which contains the full universe of managers and models and the other called MMX Select, which contains a curated subset of investments. This would be useful for advisors who are looking for research help to save them time. Many TCA advisors who leverage MMX do so to find satellite strategies to compliment their core products, Pace noted. MMX supports multiple models in each account and accounts can also hold legacy and non-model assets, if required. MMX is integrated into the overall TCA technology platform, which is called Liberty, and includes everything from proposal generation to trading and rebalancing functionality to performance reporting and billing. It is robust enough to support large RIA’s $1 billion in AUM and above. Pace informed me that TCA has never lost any of the $1 billion and up RIA’s to a big box custodian. While TCA does charge strategists for shelf space on MMX, there is no incremental cost to advisors, Pace insisted. Available managers include CLS Investments, Horizon Investments and Symmetry Partners. A few common threads can be found across all six of these products. They all limit access to only their custody or platform clients. No external interactions are supported. There is no MMI model marketplace for retail advisors. Once you select a vendor, that is the marketplace you are limited to. Unless you want to switch between custodians or technology platforms to access different universes of products. And that is not a tenable option for most. Folio Institutional Model Manager Exchange only supports professional managers so advisors interested in peer-to-peer models should look elsewhere. Folio’s strong technology stack makes them an attractive option for RIA’s interested in working with a boutique custodian that will be more attentive to their needs. MMX provides advisors who are more hands-on in their investment approach with some decent tools for directly purchasing professionally-managed models as well as the option to purchase research as well. I’m not sure I would switch custodians only for MMX, but it is a nice benefit for advisors that are interested in the rest of their technology platform. Orion Advisor Eclipse Communities only support peer-to-peer models, which is good for advisors that believe they have good performing models to offer and would like to see what it would be like to be an asset manager. Advisors that are not happy with their wealth management and considering Orion should see this as an additional check in the plus column over other products. Trust Company of America Money Manager X-Change has the benefit of both professional managers and peer-to-peer models. Advisors looking for a custodian that provides more customized service can include MMX as a bonus when making their decision. It is an excellent option for existing TCA clients who should scan the list of managers to see if there is anything there they might like to include in their client offerings. TD Ameritrade iRebal Model Market Center is not available yet, so we are not able to verify its capabilities or product offerings. But TD Ameritrade has a good track record of supporting their advisors, so for advisors who are interested in switching assets over to TD, this will be an interesting choice. HedgeCoVest SMArtX is currently only available for SS&C Black Diamond clients, so for advisors looking for a new performance reporting platform, this could be a nice two-for-one option. Advisors who are heavy SMA users and are also Advent Axys clients should definitely take a look at the platform. I hope HedgeCoVest launches an open architecture version of SMArtX at some point. Unfortunately, there is no one-size-fits all solution. My advice for advisors is to clearly define their firm’s goals and investment methodologies before searching for a new custodian or technology platform so that the benefits of a model exchange can be better aligned with your firm’s future direction.